A big dog and tiny cat strike up an unlikely friendship and the Internet can't help but blink back tears of joy. Here's something to smile about. An abandoned kitten, just days old, has been "adopted" by a loving labrador. 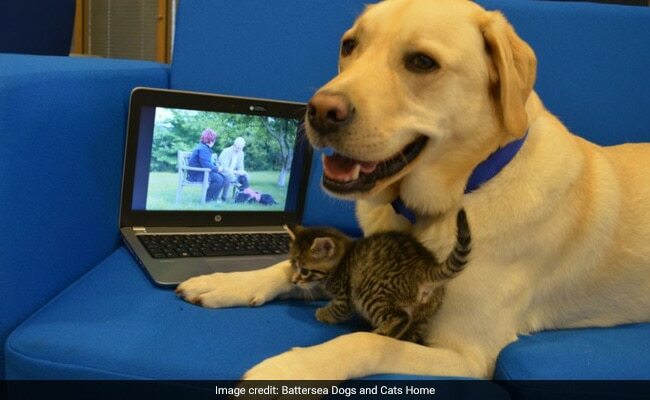 Battersea Dogs and Cats Home shared a sweet video of little Ava and her new best friend Barney. The British animal shelter writes the dog "has taken his role of kitten-sitting very seriously." The Internet can't help but blink back tears of joy at the clip of the two snuggling. The now five-week-old kitten was just days old when she was found abandoned in a London garden. Ava met her furry friend Barney at the animal shelter. The adorable duo love to snuggle, play and watch TV together, reveals Battersea Dogs and Cats Home. The three-year-old labrador monitors the kitten's every move around the office to make sure she's safe. "Barney adores Ava and can't wait to come into Battersea every morning so he can see her. It's great for Ava too, because she doesn't have a mum or brothers or sisters, so Barney has become her best friend and favourite playmate," says Head Nurse Rachel Ab'dee. "It's wonderful to see them so happy together and to know that their most difficult days are behind them," she adds. Isn't it funny how animals can do what we humans can't. Just be kind. I just love it us Brits are so gooey over a cute video (me included). Reminds us in this increasingly cruel world, there is still kindness. Fortunately, Ava already has a forever home lined up and will be on her way once she is old enough to leave. Barney, who has been adopted by one of the Battersea team members, remains "very happy to lend a paw for kittens in need."